1. Is it just a simple cord coated with (something), or is it made out of something special? 2. Is it typically left in place only for the time it takes to make an impression or fill a tooth and then removed immediately after? 3. Is this technique something that nearly all dentists use as a routine, or is it just personal preference whether a dentist wants to use it or not? Hi Hannah – You’ve got a very informative dental site – good job! 1 – it is simply a cloth piece of cord. The brand that is pictured above is made out of 100% cotton. Many times dentists will coat it with a substance that causes bleeding to stop so that everything stays nice and clean around the tooth. 2 – It is normally left in place only during tooth preparation/impression taking and then immediately removed. As Austin’s email showed, it can be slightly painful if left in for more time than that! 3 – For taking impressions of crown preps I think most, if not all dentists use it. When it comes to cutting a tooth for a crown and deep fillings, sometimes it just depends on the dentist’s preference. 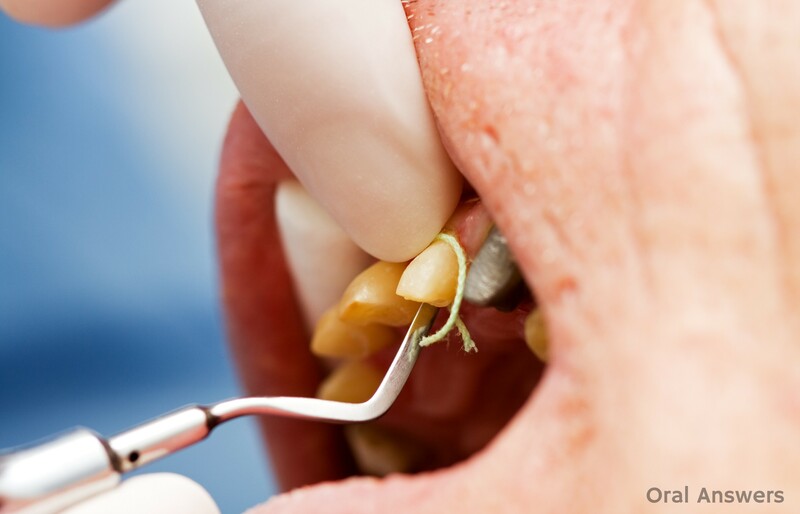 If I’m doing a filling that goes below the gum-line, I will definitely use cord so that the patient’s gums don’t get cut and so that I can see what I’m doing better. I hope that helps. Thanks for your comment, Hannah! 1: They attempted to take out all the caps and get ready for the impressions well 2 caps next to each other did not want to come out so they had to file them out…. 3: They started to prepare the retraction chord and used two different sizes I of course opted to not get the shot in the roof of my mouth because i don’t’ like PAIN well as it turns out the Prosthodontist should have INSISTED that I get it because the pain from that point on was unbearable…. 4: So now it’s time all of the “Retraction Chord” is in place and packed in and now they begin to fill around the top of my teeth with a material that was auto loaded into a dispensing gun….. WAIT the shocker is it DID NOT WORK!!!!! So they RAN to get another one however by the time they got it the other material settled more than it should have and even though they attempted the impression was unsuccessful. So my appointment was a huge flop and the staff is upfront and says well that did not work… NO KIDDING!!!!! As soon as they get the last cap back in but not yet cleaned up THE FIRE ALARM goes off…. Is this my crazy life or is having dental surgery this difficult? Should they have not attempted to 7 at once or is it needed to ensure that all of the teeth are perfectly aligned in the universe? Don’t get me wrong i want the best possible outcome and having to go through another 4 hours of torture (that is exactly what it was) is not my idea of GOOD HEALTH!!!! I want to say that the group of Dentists, Specialists and Oral Surgeons has been absolutely wonderful and for that I am grateful. I just thought that this information would have been good to have before I had this done and could have better prepared myself to say JUST SAY YES to NOVOCAIN!!!! Thanks Tom, that was helpful! I just what to know what might be the cause of the numbness of my patient on left side of his face and lips wherein I just put Gingi- Pak on Distal of 36 and done restoration of Cl II DO cavity? The only thing that comes to mind right now is prolonged paresthesia that can occur with an inferior alveolar nerve block. I hope that helps, Glad. Let me know if you have any other questions. Thanks for your comment! Thank goodness I found this page! I had temporary caps put on my front teeth a few days ago and my gums are so swollen and irritated now. Instead of the pain lessening every day, it’s actually getting a little more painful every day. Tonight, while brushing my teeth I noticed something that looks like dark string at the gum line and coming down between the teeth. I guess they forgot to remove the cord. By the time the dentist’s office is open again I will have had the cord on for 5 days! Am I at risk for infection? Should I call the dentist’s emergency number or will I be ok waiting until Monday morning? Hi Crystal – Hopefully they got them removed. If you can see the string, you could probably pull it out yourself without a problem unless it feels like it’s really stuck in there. I don’t think there should be a problem with infection – the inflammation seems to occur because of the irritation from the cord, not bacteria. Let us know how it went – Thanks for your comment! I got my question answered by your posting ! Today I sat in a dentist’s chair for two hours start-to-finish for a molar crown prep. The only thing that brought tears to my eyes was during the cord packing, which the dentist said that some people want more numbing during the packing. I managed to get through it with the primary numbing dose and no more. After feeling “rattled around” for two hours, high speed burr, low speed burr, numbing needles, synthetic buildup compounds, impressiion mold compound, distasteful packing solution going into my throat a little, etc. I had a good dinner chewing on the other side of my mouth, and a nice walk, boy, do I feel better now that my nerves are back in order ! ALSO, YOUR OPINION, if a porclein over gold molar crown is only $200 more than a porclein over non-precious metal molar crown, in today’s precious metals market, is the porclein over gold molar crown a better value, even though it is $200 more ?? How much gold is in a porclein over gold molar crown ?? I always get porclein over non-precious metal, because the porclein surface usually gets more worn out before anything ever happens to the base metal. If the gold content is high, maybe the porclein over gold molar crown can be better looked upon more as an investment, and sold in the future (asset liquidation) if need be ?? Thanks for your website. Is is very informative, and I am going to bookmark it for future reference. it’s me mr.rakesh.i want to know that ,Is the gingival retraction cord used before or after tooth cutting. Good evening. I have a temp crown on #11, waiting three weeks for the permenant and I distinctly remember the technician packing a cord when she put the temporary on for the last time. I thought maybe to keep a space for the permenant. This cord is white and is starting to come out. they all fell off the first day, which was Wednesday of this week. Im afraid I went to a new, young, experimental dentist and I’ve learned my lesson. Plus I don’t think you were around at the time of my initial serarch for a dentist. Please call as soon as you can get my information. Hi Danna – I would get in touch with your current dentist, they should be available for emergencies. The temporaries help hold the teeth in place so that the permanent crowns will fit well. Hopefully they can fit you in ASAP. Good luck! Is there some string or cord under a permanent crwn? If so, what if its coming out? hey there, iam a dental assistant and I am glad to find this page. I want to know if you can show a video or give some tips of how to remove the cords when it’s time to do the last impression. I’ve been having a hard time getting a good grip on those cords because they have to be taken out fast. so if you have anything that can help that would be great !! Hi, this post was very helpful! I think the dentist has left a portion of dental retraction cord in my gums and he will be getting a call from me in the morning. This was my second crown build up, and unlike the first time, the gum pain has not gone away. Definitely feels like something is shoved down in there were it should not be. Glad it helped, Mary. Good luck with everything! In all the years and all of the crowns I have had put in, I never came across this retraction cord. Today however, I have a couple of questions for you about this Dental Gingival Retraction Cord. How long has it been around? Anyway, I recently had a root canal done on a molar through an existing crown. There was also decay remaining that necessitated ultimately removing and replacing the crown as well. In the process, I had an upper crown replaced opposite the aforementioned one and to get a better mold for a new crown a couple layers of cord was inserted under the gum line. It went smooth. Back on the lower tooth the decay was drilled and it apparently extended below the gum line at which point the dentist indicated that the gum needed to be trimmed back in order to be able to complete the work. My question is, if the cord worked well enough to get around the gum line on the upper tooth for a mold, then why wouldn’t it be suitable to provide space to drill out the decay below the gum line? That is one of the stated purposes for using the cord isn’t it? This trimming is on a gum line that is already receding, and besides that it is fairly costly to boot. I believe this is for something called crown lengthening to conceal the exposed root due to a receded gum line. I’ll leave it to you from here Tom. Thanks kindly for your input. Hi George – I’m not an expert on the history, but I would think that it’s been around for several decades. Some dentists don’t use it, and if the crown is going to be above the gums, it probably isn’t necessary. Sometimes the crown will go far enough below the gums that it is necessary to remove gum tissue and even some of the bone underneath to ensure that the crown fits properly and doesn’t cause any inflammation in the gums after it is cemented onto the remaining tooth structure. For example, let’s say you have a cavity that goes down below the gum-line on a tooth. In order to get a crown onto the tooth, the dentist will have to remove the cavity, and exend the edge of the crown below that point in order for the crown to be able to grip onto solid tooth structure. If there’s not enough room to do that, the dentist will do a “crown lengthening procedure” which lengthens the crown of the tooth (the part of the tooth above bone) by removing some of the bone that supports the tooth. I hope that helps. Thanks for your comment, George! Lately I have had far too much experience with the retraction cord! It’s a long story, but I had a root canal in January and after having two ill-fitting crowns arrive from the lab and we are hoping that the third impression will be perfect. We just might get this stubborn tooth capped in May! During the lengthy process of having many molds taken of this one tooth, my dentist has been very hesitant to give any kind of numbing agent to dull the pain. I am curious. Do most dentists numb patients during the packing of the retraction cord? My dentist has even used a lazar at one point and the pain was INTENSE. Not to mention the smell. I understand that the tooth root is dead because of the root canal, but my gums are killing me. Should she at least be numbing the area during the procedure? Or am I a wimp? Hi Rachael – I believe most dentists do numb when packing retraction cord as it can cause pain in the gums. Normally the patient is numb when I’m doing retraction cord, but if they aren’t, I will ask them if they would like to be numb. We’ll usually do whatever makes you more comfortable. If you are uncomfortable, speak up and let your dentist know. Good luck with your crown – that is a good sign that your dentist wants to take the time to make sure that it fits correctly. I agree about her attention to detail and am quite thankful that she wants to do it right, but if crown number three doesn’t fit I feel a little better about begging for numbness on round four. Thanks for your response! I wonder if the cord is not still in my gums because ever since i had caps put on my front teeth my gums are red and get bumps around my teeth like when you have an abcess. I have bought a water pick and it made my gums bleed bad at first but it is getting better. If the cord is in there will my gums ever heal? Is there a way that an xray would be able to see it? Hi. This was very interesting for me as I just had a crown prep 2 days ago. I have 8 crowns done over the last 15 years…all the dentists have used the gingival retraction cord except the dentist 2 days ago. The temp crown he put in was quite uncomfortable. I could feel the sharp edge all around the tooth with my tongue. There was a large gap between the temp crown and my gum. Food got caught in it 3 times over 2 days. Last night a tiny sharp piece of tooth or plastic came out from between the temp crown and the next tooth but nothing felt different so I let that go. When ever I bite down to chew or just experimenting, the temp crown and the opposing tooth are the first to come together. Then tonight, the temp crown just fell off. I’ve never had this happen although always was warned that it could happen. I will go back to the dentist to morrow morning. Thanks for any answers you can give me. 1) is the temp crown the exact same as the real crown. 2) should the temp crown go below the gum too? I think they did on all my earlier crowns. 1 – The temp crown should mimic how the permanent crown will be, but it won’t be perfect. 2 – Ideally, the temp crown should adapt well to where the tooth was trimmed away. If it was trimmed below the gums, then the temp crown should go there as well. 3 – Without using the cord, it is possible to get below the gum line. There are a couple of other techniques dentists can use to get below the gum line. 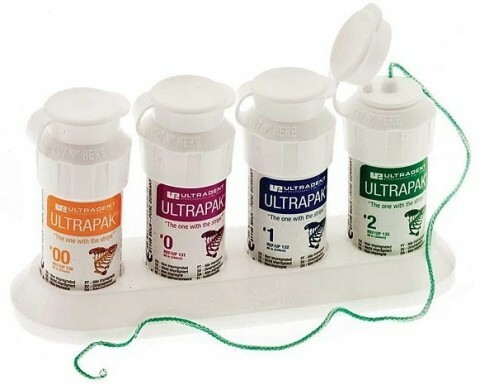 Some dentists will use a clay putty in a syringe that they keep under the gums for a minute or two, then wash it away and immediately take the impression. Another way is to take a “rough draft” impression, then add more material into that impression and put it back on the tooth, forcing the new material below the gums. This technique is slightly more controversial as it can cause the impression to be distorted, causing a poor-fitting crown. I left a comment the other day regarding everything I have been going through with my oral restoration and it seems I can’t get a break. I have the best care in the world but in your experience have you every worked with someone who just has very brittle teeth and bone? Thinking I was through everything and now just awaiting my new appointment to get my impressions, this weekend I ended up with a verticle fracture on one of the 7 crowns. There was a temp in place and now unfortunately a crown can not be used. It was the Right Incisor and both to the either side are also crowns which long term could be questionable if we are to attach a bridge. What would you recommend? I also wanted to know your thoughts on this tool called “The Tapper”. I know nothing comes easy however at what point do I just give up. Hello. If the Dr accidentally leaves the thin retraction cord in the patient tooth, what may the patient experience the first day? I had a bridge that fell out some months ago and where one tooth used to be there are these short little strings sticking up. Is that the same as the chords? I fell like I can pull them out, but just playing with them with my tongue sometimes hurt if I rub them the wrong way. There is little pieces of tooth at the bottom of the gum where the tooth used to be and it’s started to rot. But I really want to know what are all those little strings sticking up from my gum,? They are driving me Crazy! When I did my bridge over, the dentist did not use the retraction cord. Is the cord neccessary in order to get an accurate impression? Two weeks ago I had front teeth fillings done. The dentist used a retraction string to hold the gum back but did not warn me ahead of time she was using this method. I had never had this done before. Now two weeks later one of my front teeth the gum on it is still raised and I noticed it after the procedure and it is still raise now. The gum is higher up than the one next to it and when I scrape my fingernail across it I can fit my nail to where the beginning of the root would be. When I eat I feel air and food and drink going into that area of the tooth. What should I do? I am having the same problem. I didnt see a reply to your question, I will also ask this question again, hopefully to get a reply. I had my 4 front teeth crowned last Monday. They worked on my teeth, and used this dental retraction cord to make impressions for my crowns and then set my temp. crowns. I noticed that the assistant? had a problem when she first started applying the retraction cord and worked on that first tooth for more than 10 min. The other teeth didnt take nearly as long. When I got home I noticed that the front gum line on that first tooth that she worked on was over 1/4 higher than the other three. It is VERY apparent and the dentist and the assistant never mentioned this to me. The next day I was upset and went back to the dentist and ask could she see me to look at my gums. Can a retraction cord cause damage to a tooth that had a susessful root canal it was very painful the pressure was severe when the assistant did the perceedure! Hi there!! Im a teenager.I want to know ,Does it pain while cutting a teeth to put a tooth cap? Im really scared.! hello! Im a teenager. I have a question,Does it pain while cutting a teeth for putting a tooth cap? Im really scared.! No, they numb your mouth and it doesn’t hurt. I’m now curious about what I should do. I had a tooth exacted Wednesday. It’s Sunday and the day after the procedure a string was hitting my tongue and almost gagging me. I had my daughter in law cut it, but there is a lot more cord coming out of my gum on the outside. My gum is very sore. I don’t know if there are two pieces or one. I need to know, if I pull it out will I have potential damage? I’m still in a lot of pain but it is my gum hurting. I had the retraction cord put in last week, and the girl seemed to stay there forever. My face swelled a lot, though there is not pain on the gum…but I do feel a little lump under the gum and down farther than the cord should have been placed. this concerns me. Is it normal to have pain in the gum after this is done. This is the one question I can’t find an answer to on the net. So who knows if it’s ok if you pulled the string out and it’s bleeding while you wait another week for your real crown to come in? Hi Shirley – Sometimes when we pull the string out, your gums will bleed temporarily. It would be good to get in touch with your dentist, as sometimes we use more than one cord. Good luck with the new crown! I had one extraction and 10 unit upper bridge fitted on June 18th this year.strait away my gum swelled over the extraction site .The dentist said that would settle over time now two months later I have some large foreign object breaking through the gum its not a piece of tooth but is a grey blue color ..my gum is sore to touch and my lip near the site tingles and feels numb. Hi Tom, thanks for all of the info on dental cord. I’ve had it used before, but today I had a crown impression, and my gums had a problem stopping bleeding, they said it the cord was medicated, I understand now the medication is for clotting the blood. They still bled for a bit, but finally stopped, anbd they were able to get a good tooth impression as well as a “gum registration” A win-win, I didn’t have to come back to get a good impression, and my chair can be reused tomorrow for a new client (-: Your having a website shows you are intrinsically motivated by your profession, what a great fit for you! My cord has caused a blue stain on my gums and it’s been 36 hours? Is this going to go away? Is it necessary to use a retraction cord when getting a crown on lower back tooth? My dentist left some retraction cords in my mouth that just finally surfaced, it’s taken 3 WEEKS however to realize hey were there. Am I at risk for any infection (since I noticed my breath started smelling different). How did they get it all out of the crown is already cemented in? Is it possible that a dentist does a root canal and crown all in one day? If so, what could be problematic from it – if any? Thank you! I had a crown prep done on my back lower molar on the 6th so just a few days ago. The part of my gumline that’s by my tongue has a U shape chunk of it missing. It was a dark purple color now its turned white. I have had other crowns done by other dentists and this has never happend. It’s been very painful and I’m supposed to go in next month for the permanent crown. I’m scared my gumline will not heal. The side of my tongue keeps rubbing on it when I talk. I’ve started rinsing with salt water to help keep it clean because I can’t brush over it. Is this normal and is there anything I can do to help heal my gumline?